In 1965 well known mountaineer and reporter Walter Bonatti, accomplished a solo expedition by canoe down the Yukon and Porcupine rivers for Epoca Magazine. Following in the footsteps of London and visiting the gold rush sites, he moved from the Chilkoot Pass up north to the Klondike. He experienced the amazing Yukon ice breakup in Dawson, explored Bonanza and El Dorado Creek and prepared himself for the long canoe trip. He paddled down the Yukon from Whitehorse to Fort Yukon (AK), moved to Old Crow Canada and paddled back to Tanana down the Porcupine and the Yukon rivers. “The Yukon blues” is Igor D’India’s attempt to recreate this journey to document what has changed since then, with the fresh view of a young video maker. 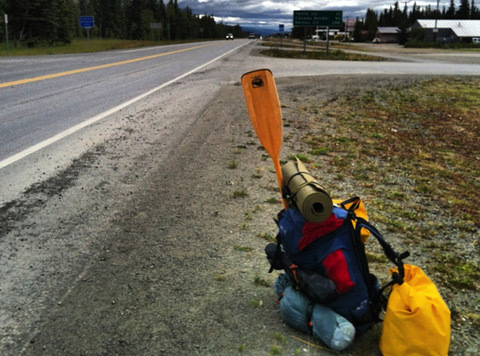 He hitchhiked from Toronto up north to the Yukon Territory and is on his canoe from June to the end of August. 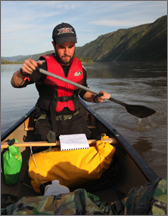 Following in the footsteps of Walter Bonatti – Igor D’India recreated his epic voyage down the Yukon River (around 1500 km solo trip on a canoe without external support, gps, and phones) for more than 17000 Km in total. Throughout as much as the journey as possible, Igor will be documenting his experience using his accomplished skills as a Videographer and Filmmaker. In the vast Great White North, they often say that most people who have arrived years ago in the YT did not want to return to their old lives. A strong sense of nostalgia hits everybody's heart when they have to leave those lands after they have discovered the romance of living in the bush. For those who are forced to come back to the civilized world, there will always be something missing, something very tangible they cannot put into words. This feeling is called “The Yukon blues”. The real creative challenge of this project is telling a story which is a combination of a great self-filmed adventure in the wild with no external support, and a top quality tv series. This film is about how our life can be influenced by casual crossings with other people's experiences. It is about adventure without compromises, world records or extreme performances. It is a personal research of a normal man through his own dreams and fears, following in the footsteps of a great adventurer.